Point to Point Internet set up with no other hardware to install, other than the SIP-enabled IP speaker. 96dB with a 10 Watts Peak Power output. 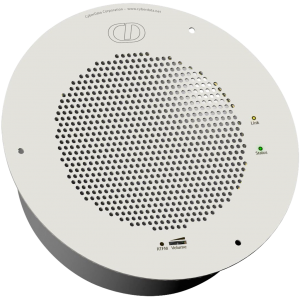 The CyberData v2 VoIP ceiling speaker is used for mass notification, event and emergency notification within IP Public Address applications. The IP POE Speaker can be deployed as a stand-alone unit. The IP Speaker effortlessly integrates direct to the physical network on a single cat5e cable. It uses POE connectivity and registers to the IP Phone System, utilising the SIP architecture. The Speaker can be uses indoors and outdoors. Its SIP RFC3261 compatible and has passed interoperability testing with over 30 IP Telephony and networking vendors. The entire set up is no different than that of installing an IP Phone and adding an additional user/extension. POE-enabled IP Speakers are deployed in new builds where the End User is installing a VoIP Phone System and IP-PBX/SIP Server (also integrates to hosted/cloud solutions). The device is also popular as an add-on, sometime after the end user has already invested in IP Telephony, where they are looking to overhaul their Public Address system. There are many reasons why End Users have VoIP and SIP based overhead paging systems installed. The most common is to control all building facilities under one central IP system. We deploy Telephony over IP, Surveillance over IP, why look to put analog speakers in. This would create a separate system to manage and maintain. An extra maintenance bill is an added expenditure to the organization. RFC 3261 is the adopted protocol for VoIP networks. 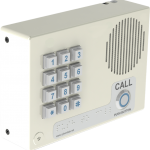 The POE IP speaker works with any IP-PBX and IP Phone System that conforms to SIP RFC 3261. The IP based speaker system has passed interoperability testing with over 35 IP manufacturers. Including Panasonic, NEC, Mitel, Avaya, Broadsoft, Cisco, Asterisk based systems and many more. The CyberData v2 VoIP Speaker is the only event and emergency notification system to integrate to Microsoft Lync. Patton and Cyberdata joined forces to create this Microsoft Lync certified solution. Accessories for the IP Speaker. The IP based speaker system is predominantly bought as a stand alone IP speaker. 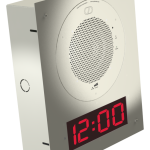 However, you can also mount the VoIP speaker to a CyberData IP Wall Mount Clock kit. Other options include: Electro-galvanized Steel – Conduit mounts, Ceiling Mounts.